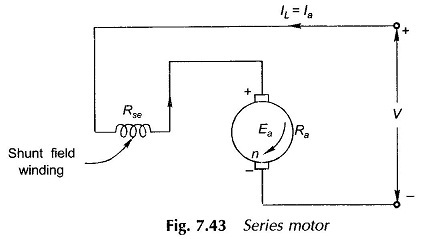 Figure 7.43 shows the connection diagram of a dc series motor. The speed for this motor is (refer to Eq. (7.48)). These relationships are plotted in Figs 7.44(a) and (b). 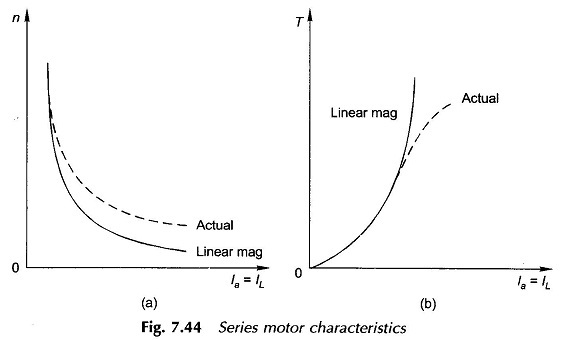 Saturation and armature reaction demagnetization both cause the flux/pole to increase (with respect to /a) at a rate slower than in the assumed linear relationship. Actual characteristics are plotted in dotted lines in Fig. 7.44(a) and (b).